On this date in 1977, the Growin’ My Way Nursery ran this ad in the Long Beach Independent. The Pacific Inn now occupies the Growin’ My Way location. The nursery was a vast enclosed jungle-like labyrinth of exotic and everyday plants and gardening accessories and decor. 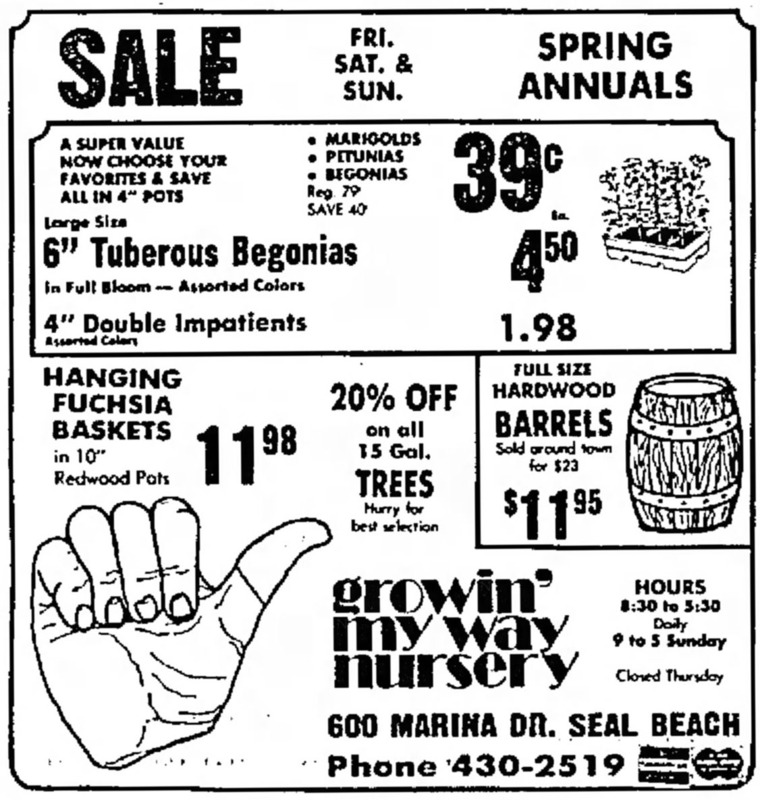 As the ad above shows, they sold typical gardening fare like marigolds, petunias, and begonias, but they also stocked venus fly traps and Tiki pillars. Seal Beach kids of a certain generation will also recall that there were two public drinking fountains that offered chilled water in Seal Beach — the one in the library on Central Avenue and the one on the side of the nursery. This was crucial knowledge on hot and thirsty summer days back in the seventies. This entry was posted in Seal Beach History and tagged 1977, 600 Marina Drive, Growin' My Way, Growin' My Way Nursery, Marina Drive, Orange County, Orange County history, Pacific Inn, Seal Beach, Seal Beach History, Seal Beach Nursery, Southern California, Southern California history. Bookmark the permalink.